Tonia Reyes Uranga is the Principal Owner of Tonia Reyes Uranga Consulting, better known as TRUConsult, an entity that serves non-profits, public agencies and specializes in workforce and municipal policy issues. Tonia has over 30 years working with workforce and employment issues in Southern California, including working with the Department of Labor (DOL) to explore Non-traditional careers for women and working to facilitate policies and training programs in DOL’s Region IX. Tonia has worked for the City of Long Beach and County of Orange Workforce Development programs as an Employment and Training Contractor and served as the first Executive Director for the Miguel Contreras Foundation, a Foundation formed by Business and Labor Leaders. 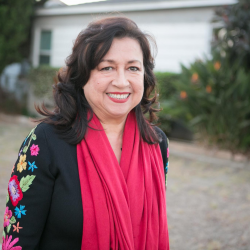 She served on the Long Beach City Council from 2002 to 2010 and served on the South Coast Air Quality Management District (SCAQMD) Governing Board representing the L.A. County Western & Eastern Regions. She recently served as Board Member to the statewide Coalition for Clean Air. She presently serves and is on the steering committee for the Coalition for Good Jobs and Healthy Communities and serves as Vice-President for Goals for Life, a youth mentoring non-profit. Tonia has also served as Executive Board Member for the California Democratic Party representing the 70th Assembly District. Tonia’s recognitions include the Women in Non-Traditional Employment Roles (WINTER) Public Service Award, Leadership California Community Leader Award, the NAACP Humanitarian Award and the LAMBDA Human Rights Award and the Champion of Justice Award from the LB Area Peace network, to name a few. Tonia Reyes Uranga earned her B.A. at the University of California at Los Angeles (UCLA) and graduated from the Harvard Kennedy School’s Executive Education Program for Senior Executives in State and Local Government. She is a 45-year resident of Long Beach.